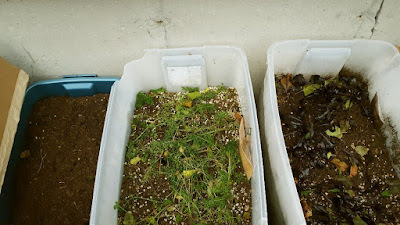 The Winter Garden: The cold frames that I made are doing their job so far! I have greens and roots...some have stalled, some are still growing, despite the deep freeze. The garlic patch is snowed in and I'll have to see if I have success in the spring. Tomorrow there is a break in the weather and it'll be above zero. This may be my last chance to water the winter garden before next year. I have a feeling the only veggies I'll be harvesting will be the winter lettuces and the carrots/beets that I'd started in the summer. Still though, this is a fun experiment! 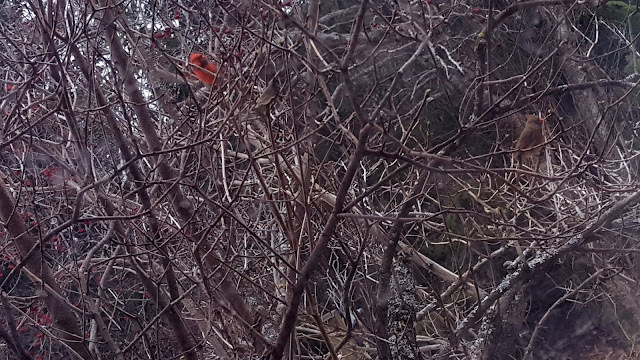 By pure chance, Alex was looking out the window yesterday morning at the lilac tree and saw a cardinal couple! We rarely see those birds in this area, he managed to get one photo from the cell phone before they took off. That was a nice bit of luck! Native lore says that if you see a cardinal, then a romantic encounter is imminent. :) Another bit of lore is that if a cardinal visits you, he's telling you to start that project that you've been putting off! 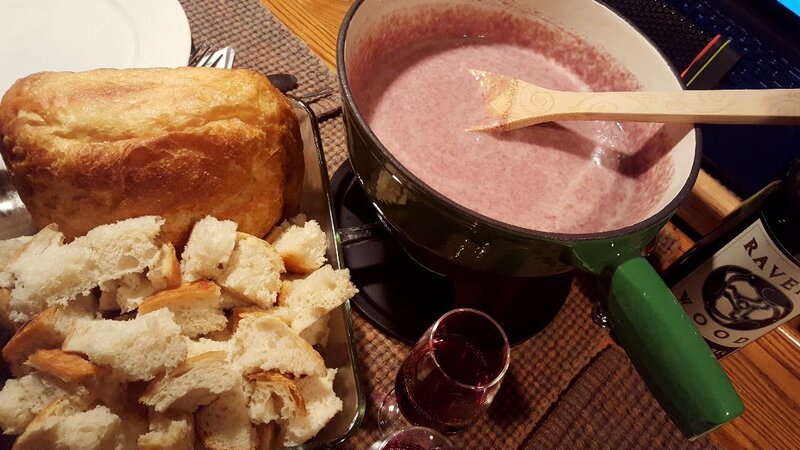 How time flies, it was fondue night again last night! That means another milestone celebration. :) Alex and I have 4 years and 8 months under our belts. :) As corny as it may be, I love to celebrate our monthly "anniversary"! 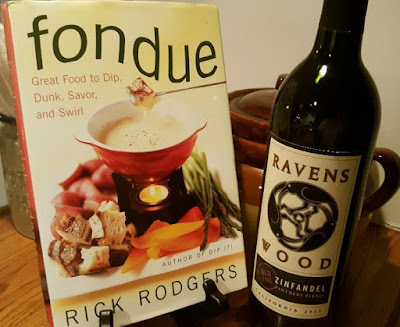 I made a Roasted Garlic, Cheddar and Zinfandel Fondue last night...holy garlic, it calls for two entire roasted garlic bulbs....and this one uses red wine. I used to be an old school fondue type of gal: Swiss, white wine, bread cubes. I'm happy that I'm branching out now, the red wine gave the cheese such a nice flavour! If I make this again though, I'll cut the garlic WAY down! 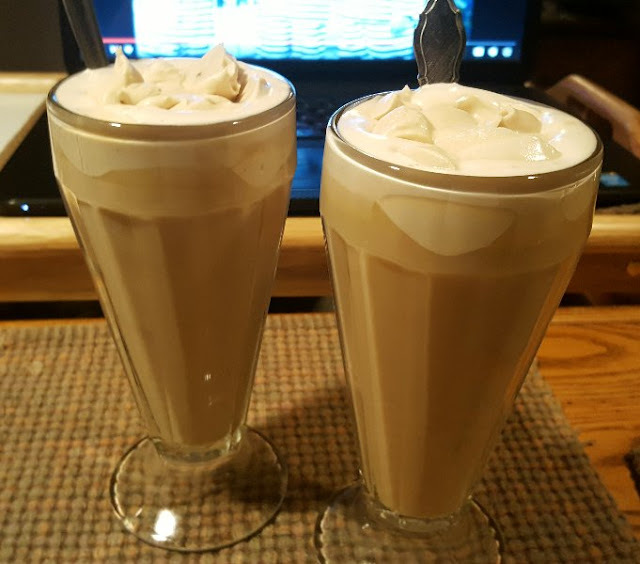 Alex made us some Irish coffees for dessert too, it was such a nice meal! Rain, I was browsing through the camembert at the grocery store the other day, and thought of you. Love your take on the gift! The hallway perspective is very Kubrickian! Cardinals are very pretty! I don't think I have ever seen one in person..maybe we don't have them in Alberta? I also like seeing Blue Jays. I might need to do a fondue or a hot pot soon...it's been too long! Oh I just love that painting! I wish I lived in a house that had a hallway like that. :) Envious of your winter garden! I will keep my fingers crossed it all turns out well. This weekend shall be cheesemaking weekend for me! Wish me luck!!! I love the picture of the cardinal! Such a pretty bird! I do not think we have those in Manitoba. I have never seen one. I keep a log of the birds that come to my feeders. I think the most interesting one I have ever had come for a visit was a ring necked pheasant - that was such a bizarre sighting! Fondue night sounds so neat. It was beef stew night here and now it is left over beef stew day. Love your gift wrap piece for SP! Great capture on the cardinals. Congrats on your monthly anniversary, well celebrated. I must admit I don't like Irish coffee the time I had it. I remember tasting mostly just liqueur. That Irish coffee looks delicious. By the way, I posted the link to the pear gingersnap pie now. That's a lovely image about gifts, sort of surreal. I'd really enjoy the dessert. I haven't had a fondue in decades. Fondue! You’ve inspired me...We haven’t used our fondue pot in ages! Are you trying to creep me out? LOL! I live alone, girlfriend....I am NOT watching Jack the Ripper! LOL! And I am also not going to open that pretty package as I can just imagine what's inside! (Just joking with you)...I love your pretty package but not the long dark hallway. I watched Fargo the other night and although a little gruesome and lots of cuss words it was a true story and I wanted to watch it. It was very good actually. There was some humor too which helped lighten the scary parts. 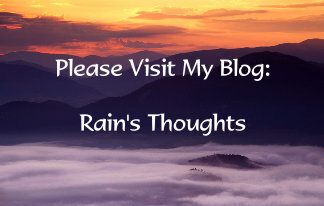 Your blog posts are like a memory game because once I open the comment section I can't go back and see your blog and I don't want to forget anything. Happy Anniversary and that fondue sounded great, I love read wine not white so much and the more garlic the better! That Irish coffee looks so yummy! 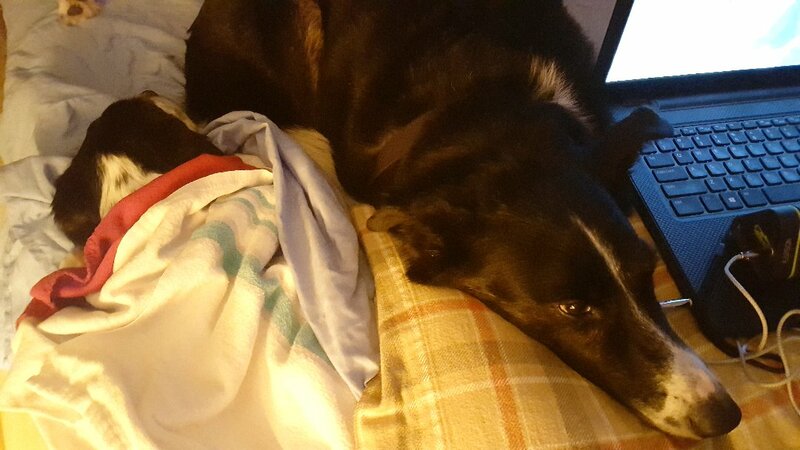 Your dogs all curled up around you is so sweet...they love you so much! I will be anxious to see how your winter garden does. I never did get anything planted and the ones I brought inside are not doing too well. A belated hau'oli la ho'omana'o to you and your husband. I'm glad you had a lil' special somethin' somethin' that night. You are so much more productive than me. You gave me too much credit. I haven't knitted for a bit because I had to finish my swap partner's advent gifts and get them mailed off today. Nice gift wrapping....and the milkshakes look YUMMY. It's always so much fun at your place! 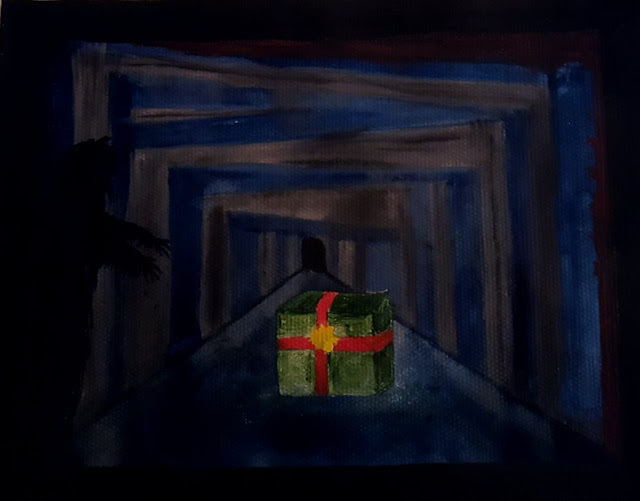 I always enjoy your artwork and I love how you've added a spooky effect to the wrapped Christmas gift. Very cool. And every time I read a post of yours, I get hungry. LOL It's wonderful seeing cardinals. They're pretty shy birds and it's difficult to get a glimpse of them, let alone a photo. Oh my gosh, I haven't had a fondue in years! We have a brand new fondue pot that I should put to use soon. I think it would be such a nice treat! Oh I have spent some time on that "naughty" list in my day, but at my age it takes too much effort to be naughty so I guess the gift is not for me :) Sounds like a great challenge though ... hmmm can you go for it if you aren't on the "naughty" list? Rain, we have cardinals down here, too. M and I saw one on our way to town the other day, he flew so low and fast across the front of the jeep I thought I might hit him. But I was only doing about 30 mph so he just made it clear. Cold, snowy weather is perfect for nice meals in side. It helps everybody stay cheerful to have good , "comfy" meals and to feel snug when it's cold and snowy outside. I'm glad everything is ok up there. Oooh, you are pretty diabolic there with that gift. I think I'll pass, I can't run anymore and I've lost the ability to make myself invisible. But I do like all the other "gifts" in this post. Your winter garden experiment sounds very intriguing and I love seeing cardinals. Someone told me a visit from a cardinal is a visit from someone in your past. That looked like quite an enjoyable celebratory meal! Not being very brave, I think I'll just let that gift sit where it is! I am a big fan of zinfandel - any big-bodied red wine. I bet that was a mean fondue! My kale is still perking along - almost nothing kills it. But the rest of the garden is toast. I had all good intentions about getting my cold frame planted, but now it is a freeze frame and too late. Must get pretty cozy in bed with the seven (plus) of you! No chance of YOU freezing! Hi Dianna :) I can't wait to see how your Mozza goes! I'm very excited for you, I'll be around, so email me if you need ANYTHING. Interesting what you said about the cardinal, Jenn (above your comment) is from Alberta and she said she doesn't think they are in Alberta either, not a prairie bird? I know they love forests and lakes. Wow, a pheasant is a rare sighting, I've never seen one here! I love birds, I think it's neat that you keep a log of them. I've been wanting to start doing that for a long time, it's one of those hobbies I keep putting on the back burner though. Hi Gill :) Beef stew, Alex loves it. He asked for some! The fondue was definitely delicious but way too much garlic for me! Hi Christine :) Thanks! I didn't have any cute ideas for the theme, of course, the monsters got in the way lol...The way we make our drinks, we always use a lot less alcohol than is called for. I can handle wine any time of the day, but both Alex and I are light-weights when it comes to spirits. We just put a sprinkling in the coffee for the flavour and it was great. Hi Sandi :) Yay! I'm glad I inspired you! We have a fondue every 14th of the month since we got our pot in the summer. It's a huge pleasure!! Lol Sam...I LOVED your comment ha ha ha...See, I don't know what's in the actual gift...well, I may know, but I'm sworn to secrecy...you'll have to outrun the monsters to find out lol...Oh Fargo! That is one of my absolute favourite movies!!! Each actor is just wonderful in it. They also made 3 seasons of television series on FX, we watched the first two on Netflix and You Tube. The third one is out now, and I downloaded it a few weeks back. It's a very good series! But, I think the "true story" is exaggerated, at least that's what I read about it. Still though, great stories. Oh Sam, if you right click on the comment link, maybe you'll open a new tab so you don't have to play a memory game, lol...but also there's a link on the top that says "show original post" and you can at least see the words, not the pictures, just above all the comments. Hi Lorraine :) Lol...I have never had the ability to be invisible! That's a sweet idea about the cardinal. I like it. :) The fondue was spectacular...but that garlic oh my gosh. We could smell it on our clothes and hair after lol...the winter garden, well, we shall see. I have high hopes, but they are in doubt at the moment! It just may be too cold here for it! Hi Susan :) No chance of freezing with 8 fur coats lying on top of us lol...Me too re: the wine, I love big-bodied red wines a lot. I could enjoy a "vin nouveau" aka a Beaujolais...but those hearty ones are my favourite. Kale...I've read that nothing kills it, but I can't stand the taste of it, and I tried! I'll see in the spring, but I'm starting to think it'll just be too frigid here for a garden in the winter. I'm going to work on my indoor garden after the holidays and see what I can grow by the window again! Wine - Red wine (there is no other kind), most especially anything that is an Old Zinfandel (from a head trained vine, sometimes decades old). We get cardinals all the time down here. The Ravishing Mrs. TB is very pleased as these are some of her favorite birds. The fondue looks really yummy. :) No matter what happens with your winter garden, you will walk away with information you can use next year! Experience truly is the best teacher. Thank you so much for your wonderfully imaginative contribution (both the art and write up on it)! I love it. You really get my mind working here too. Hehe, yes, I am an all round big hearted guy but you know, definitely have a tongue-in-cheek cheeky nature too so I'm gonna put myself on the naughty list! Funnily enough, Alexandra had this IG story vid with a poll asking if I was naughty or nice? Mind you, there was a pic of me as Santa. The results indicated 75% felt I was naughty and the remaining, nice! Lol. 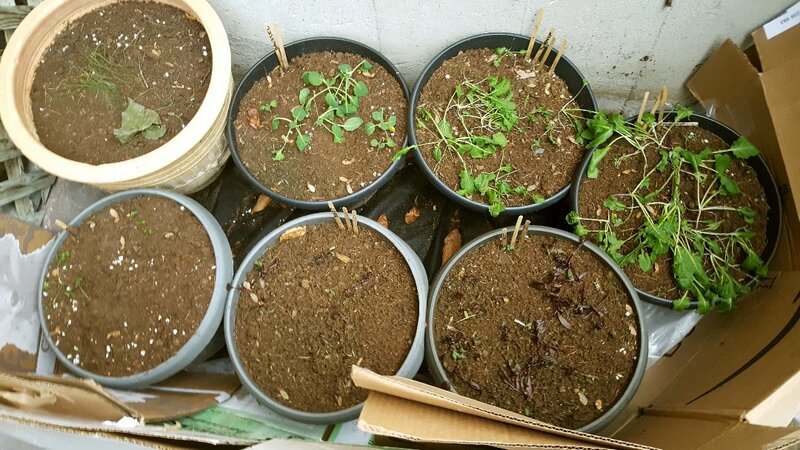 Your indoor garden is coming along well and speaking of winter gardens, I had no idea there even was "winter lettuce!" Sad how removed I am from the earth in that sense. Such a city boy at heart but I do love gardening (when I had one) and love seeing things blossom etc. What? You are in Quebec?! how lovely. Not Quebec City obviously, judging from the woods, etc. Alex and I would love to visit the latter, however, and even have it in our plans to celebrate one of our anniversaries there since it is in the Christmas season and would be magical. We were going to do it this December but with all the expense and time for travel for my mother and family, that's not happening now. Maybe next year. If you are nearby, we could connect over fondue at some restaurant or something perhaps? That would be fun. Those Irish coffee dessert drinsk look divine btw. I'm sure they were thoroughly enjoyed! BTW, I have our new Scribble Picnic themes/prompts up on the side bar. I think you'll rather enjoy some of them and some will get the creative wheels spinning. We will take a break for next week since it's the day before America's Thanksgiving and many of our picnickers will be busy shopping and cooking big family meals and whatnot! Your fondue sounds delicious, Rain! It's something I haven't had in ages ~ too worried about calories, I guess. I love cheese, and I'm afraid I'd get out of control ~ LOL! 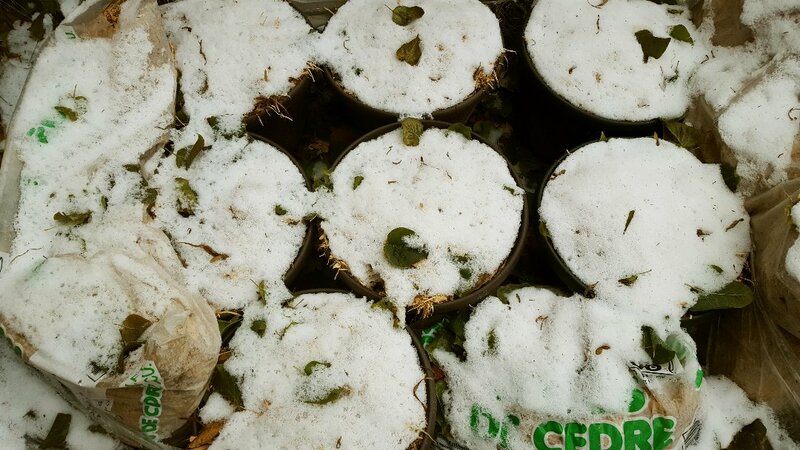 Good luck with your winter garden. In an alternate universe I garden and don't travel. Have a good one, my friend! your painting is amazing, your imagination is exciting!!!! 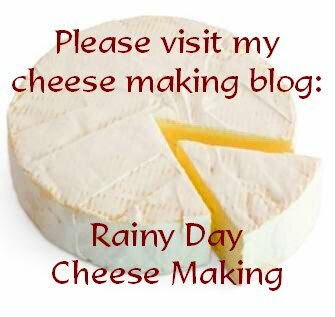 I have been following your cheese making and its really interesting,, and very successful too by the looks of it!! Hi Michael :) Lol that you are on the naughty list AND you have documentation to prove it! I love the new themes on your picnic. I have a lot of ideas and I do hope I can keep it up this year. I love the challenge of thinking outside the box a little bit! 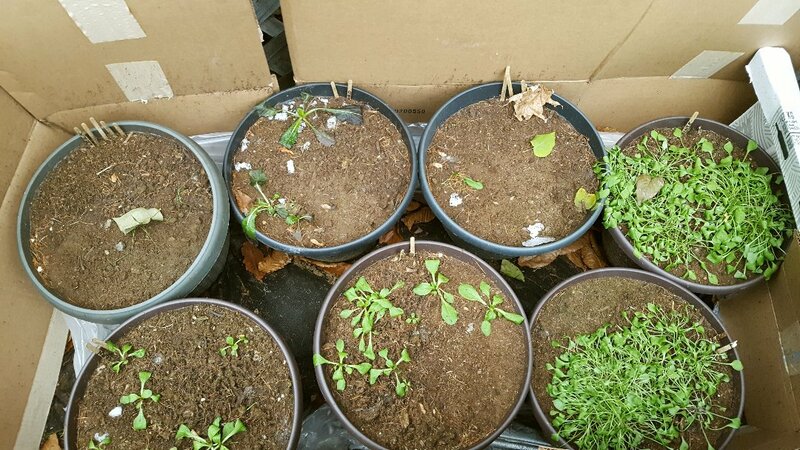 Oh the winter garden...it's my first year and a FULL EXPERIMENT...I feel Dr. Frankenstein lol..."IT COULD WORK!!!" ha ha...the winter lettuces are really "greens"...mostly what's called mâche (which is also called corn salad) and miner's lettuce (also called claytonia). Those are supposed to grow year round, but I can't see them pushing out of that frozen earth...time will tell! I'm excited about it though, knowing that if we crave a salad in January, it'll cost us over $6 for a terrible head of lettuce that has no flavour anyway. Hi Yarrow :) The fondue was very rich and super garlicky...I couldn't handle it, but did I stop? What do you think lol? :) Raclette is huge here, in fact a few months back we found our first Raclette appliance at a second hand store and it works perfectly. I have a Raclette planned for the holidays, I haven't had one in ages! I was hoping to have my own cheese made for it, but that was a lofty plan...no time at the moment. The winter garden, we'll see! I planted a small amount just to experiment. I can't wait to pull some carrots after Christmas though, apparently they get much sweeter as the weather gets colder! Lol Michael...yes...and you are very right, I would likely shout out "it's ALIVE!!! ", not caring a hoot about who hears me ha ha. Oh this is shivering for me ! you are so clever and naughty to create such fabulous art dear Rain ! wonderful painting with scary plus exciting touch my friend! I loved the idea of monthly anniversary,Happy anniversary to you love birds!!! may you see many many and many more together! Thank you Baili :))) I'm glad you liked the painting! :) We have had a lot of snow and it's so cold...I see plants looking so-so outside...I can't wait to see how this all turns out! Oh I LOVE a good cheese fondue! Miss them so much. Hi Guillaume :) We hadn't had fondue very often until we got our first pot together and now it's every month! I hope you have some soon! Sorry that I'm late getting around everyone...it's been one of those weeks. I think the last fondue 'party' I ever had was back when I was 17 so over 40 years ago...can you believe it?! I was at my then-boyfriend's house for the weekend and everyone was talking about having a 'fondue party' that very night. At that young, naive age, I had no idea what a fondue was so I'm thinking they are having an actual party...dancing, loud music, etc. Imagine my surprise when we sat around the table at dinner with just the family and two fondue pots on the table. I then learned what a fondue was...I have no idea why they called it a party though...maybe it was an Aussie thing. They had one fondue pot filled with oil and one with the cheese sauce if memory serves correctly. And everyone cooked their own food. Quite an experience. Thanks Serena :) Take if you dare is definitely the idea lol! :) Do you dare? ;) NOT me! That's a cute story about your first fondue night!!! I've had the oil fondue too, we used to call it "fried fondue", but I never really liked it...that hot oil scares me actually. I remember getting burned a few times as a kid. We stick to the cheese fondue, the hot pots made with broth and hopefully one day I'll get around to the chocolate fondue!